My favorites in this book are carrot soup, split pea soup and hummus. My edition of this cookbook is a hardcover from 1977 - perhaps a first edition. I used it for years before becoming an empty nester (used to live in Ithaca NY where the restaurant is located). So many favorite recipes from this book: two for starters are the recipe for Pesto (the only one I rely on for excellent basil pesto) and the Hungarian Mushroom soup. Also a favorite vegetarian casserole - Cauliflower Marranca - but watch out for the calories! So many terrific recipes in this book. I guess I have a sentimental attachment to it. Really good, basic cream of celery soup. Loved it and would make again. A very tasty recipe! We omitted horseradish (personal preference.) Will definitely make again. Never use a recipe any more, but this is still the basis of mine, except always with fresh mint & cucumber. Pre-packaged mush sold these days can't compare. The name alone still makes me smile, but it's also simple & tasty. Yes, the real thing! But too rich for me. So, use n/f yogurt and increase the amount of cabbage - 6 or 8 cups. Made w/carrots, red peppers, apples. This does look like the way out, to replace deli containers full. I made the cabbage variation without the green peppers. I made the seed/nut topping which I am glad I did because it added a lot to the dish..texture. I liked this. It is a little on the sweet side so more vinegar might be need by some. I used white wine vinegar. I also used low calorie mayo so it would be quite rich as noted by susan g if one used regular mayo. The amount of dressing is generous so maybe make the dressing separately and add as much as you want. This makes a lot. Next time I would make a 1/2 quantity seeing there are just two of us eating. It would make a very nice pot luck salad because they want you to make it ahead and meld in the fridge for a few hours. Had this for lunch today and remembered that the original recipe was in this inspirational book. We have been eating this sandwich about 2 or 3 times a month for the last 35 years, so it must be good! We always add the 'hidden raisins'. Since we're not eating grains right now, I used the eggplant as the "bread" instead and added avocado. It was pretty messy to eat but very tasty. One of the few recipes I make now from this spattered old book. Bake & freeze it every fall when peppers are plentiful. Use tahini instead of tamari, multicolored peppers, more cottage cheese (24 oz) & feta (1 cup). p. 104. This is mostly a peanut sauce to go on top of the vegetables listed. Being surrounded by pastry absolves many sins, but this was pretty bland, even with the addition of some red pepper flakes. This was basically great but had very little flavor. Need to spice it up more somehow - add a saltier cheese and more cayenne or something along those lines. I had to salt this dish quite a bit to make it taste good. Texture, etc was great. Great spinach lasagna....using homemade ricotta and fresh spinach makes all the difference. I really liked this dish. Raised the oven temp to 400 to shorten the cooking time and used acorn and butternut squash (one of each). Scored the flesh of the butternut and added the optional currants. Baked unfilled squash about 20 minutes, then filled about 15 minutes more. this has been my go-to recipe every August when the huge zucchini show up at the farmers markets. I substituted cashews for peanuts and coconut milk for coconut, because that is what I had. I also fried the cauliflower with the onions because I prefer it baked not boiled. I also put in half a lime instead of the lemon as I think that goes better with coconut. The result was a very nice curry, quite mild. It could have done with a bit less salt, though. Love this recipe! Have been making it for years - great as main course with a leafy green salad. Usually do not add the caraway. Delicious and interesting. I could not locate dried soy beans so I substituted dried chickpeas. The recipe was delicious!! This first time I made these, I threw all eggs into the mixing bowl, forgetting to separate the whites. As I couldn't reverse my error, I ended up making a zucchini feta frittata, which was very good served with plain yogurt. The second time, I was more attentive and followed the recipe. The pancakes turned out very nice- as another reviewer described- crispy and soufflé like in the centre- these make for a very nice appetizer or side dish. Can also be served with thin slices of smoked salmon or a bit of caviar. These had very nice texture - crispy on the outside, soft and souffle-like in the middle - and flavour, the latter in large part because I used fresh mint. I don't know that they would have been nearly as good made as per the recipe with dried mint. Delicious! Mixed in half a cup of blueberries just for something different. We loved the crunchy crumble. It was alright, but a bit bland. 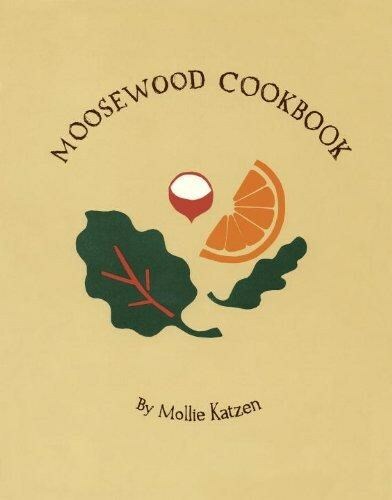 A compilation of recipes from the Moosewood Restaurant with vegetarian and ethnic emphasis.